Just a little something I thought would be interesting to get the community involved in for some fun. Pick any 2D Zelda graphic that you want, and upgrade it to a higher resolution. The repository of completed things would be kept in this first post, with the contributing artist identified. Fairly simple process, as shown above. First, locate the original graphic somewhere. Next, scale it up x2 in both dimensions. 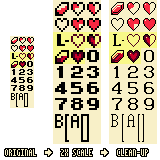 Finally, to do a smooth version, clean up the pixels so that the look is less boxy, while also shaped out a bit more where applicable. For the high resolution version, do some cleanup to make it look nice at the new resolution, bringing it back to a x1 pixel scale in the process. Just a few basic rules to keep everything steady, and straight forward. -You may update a previous entry if desired. -Critiques and edits are welcome; we want the community effort to look nice, and so the community should be able to contribute with the process of getting an entry to look nice as well. -Everything in here is free to use, with credit. Since we don't directly own the graphics anyway, since it's all stemming from official Nintendo works, everything in here must be free to use. However, if you do decide to use someone's work, give them credit for the effort they put into it! If you want to keep things organized as I did in the process example, feel free to download and use the template (and make it larger as needed, if your graphic is bigger) above. Edited by Koh, 23 April 2016 - 10:12 PM. Edited by Koh, 10 April 2016 - 03:41 PM. Of course, everyone can jump in whenever. This is all for fun~ And who knows, maybe you'll see your effort in a playable thing someday. This is it for me today. Edited by Dimentio, 10 April 2016 - 05:04 PM. Nice of you to join in~ Seems like what you attempted is a smooth resolution sort of deal, instead of a high resolution version, which could be a separate, sister project to this one, actually. Or maybe, we could include it here, and update the template...hmmm, what do you guys think? Edited by Koh, 10 April 2016 - 05:59 PM. Gave it some thought, and I guess it couldn't hurt to allow for both versions. Updated the template and my things so far. Edited by Koh, 10 April 2016 - 07:22 PM. Smooth, High Res, and High Res Shaded. EDIT: Also, you put a leaf image for the small key image. Edited by Dimentio, 10 April 2016 - 06:29 PM. Hmm... here's my first attempt at increased the resolution. Here is a set of more items! And here's another. I'm not sure I like these as much as the other tiles. And here is my last one for tonight! Edited by FlameCursed, 10 April 2016 - 08:39 PM. Looks pretty good for your first try; I'll add them to the respository now. There are some tweaks that could be made to give them a better shape, which I'll demonstrate tomorrow for you using those same items, to help you out with the process. It seems like you mostly just got rid of the outer pixels (especally apparent on the last set of items), which you do end up doing most of the time, but sometimes you actually have to shape things out better, given the new extra space. I was actually going to do the Wooden Sword next (just kinda doing random sprites off the spritesheet from Spriter's Resource, lol.). Edit: Ahh, what the heck, here's the Wooden Sword for an example of what I mean. Since it's a vertical entity, you're most definitely chopping off the outer pixels on the far left and right of the sprite. However, with the space now, you can definitely identify the tip of the sword, and the edge of the hilt better. Some slight alterations to the shading on the tip gives the diamond-looking tip swords usually have, and finally, the little bar part between the blade and hilt, shown in a bit more of a topdown fashion by one pixel. Hope this helps~ Of course, I'll be adding both versions to the respository =). Edited by Koh, 10 April 2016 - 08:54 PM. First image was an attempt to improve the shading, second does that and reduces the size of the left foot, so as to seem behind Link. Thoughts? Am I doing this shading thing right? Wow, there's so many different ways to do the same object. Each one I look at I think, 'huh, I would've done it this other way'. Seems pretty good to me; light source is the top left, yes? Interesting how you made shades of the 8-bit colors, instead of giving it 16-bit makeover. IS this an update to the old shaded one? Yes, and yes. Any suggestions on improvements? I'm a noob at spriting. Also, which one looks better? Top image, or Bottom image? Edited by Dimentio, 10 April 2016 - 09:28 PM. Edited by Koh, 10 April 2016 - 09:32 PM.